The following story is the 2nd installment in a new series from Transition US, called “10 Stories of Transition in the US.” Throughout 2018, to celebrate the 10th anniversary of the Transition Movement in the United States, they have been exploring 10 diverse and resilient Transition projects from all over the country, in the hope that they will inspire us all to take similar actions in our local communities. The project was in part inspired by the 21 Stories of Transition, and forms a wonderful addition to our story collections from across the Transition movement. First, people had to replace what that they already owned. Through a process that real estate broker Bernard London called “planned obsolescence,” products began to be designed so they would soon fail. Second, the American people, and eventually the rest of the world, would need to shift from being the thrifty citizens that were so celebrated towards the end of World War I to the voracious consumers we are today. While this extreme wastefulness was once seen as our civic duty, there is now a growing movement of people throughout the United States and all over the world who are finding better ways to strengthen their local economies while helping to heal the planet. One of the most exciting new strategies for doing this is a repair cafe. Even a few decades ago, shops that fixed shoes, televisions, and a number of other everyday products were still commonplace, but these institutions have been nearly wiped out in recent years. In their place, repair cafes are now providing people with opportunities to breathe new life into broken things while cultivating community at the same time. The modern repair cafe movement was born in the Netherlands in 2009, and it is now estimated that there are more than 1,300 such cafes operating in over 30 countries. The idea is quite simple, and fairly easy to replicate. 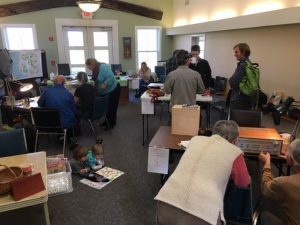 At least partially building on Transition Pasadena’s early success, repair cafes have now spread to Transition Town Charlotte in Vermont, Transition Howard County in Maryland, Transition Houston in Texas, and Woodstock Transition in New York. In contrast, Ginko Lee, who helped Therese Brummel publicize Transition Pasadena’s Repair Cafe before becoming one of its most committed advocates, now has about a dozen volunteer organizers and 50 repair people who come out to each event. Fixers are not the only volunteers who are needed to support these events. In addition to planning, soliciting donations, and obtaining food, volunteers run registration tables, manage the flow of participants and broken items, and lend support to those making repairs. The response to Transition Pasadena’s initiative has been so positive that two of their greatest challenges are having too many people attending and having so much fun that no-one wants to stop at the scheduled time. Many repair cafes also include other activities for people engage in while their items are being fixed. In addition to having stations available for knife-sharpening and a bring-something-take-something market, there are often seed-swaps, live music, haircuts, massage chairs, educational materials, and classes on worm composting, chicken-keeping, backyard gardening, and other resilience-building initiatives. Although the benefits of these cafes include repaired clothes, furniture, electrical appliances, bicycles, crockery, toys, jewelry, and more, the greatest benefit may be the increase in community spirit that is generated by these events. 1. 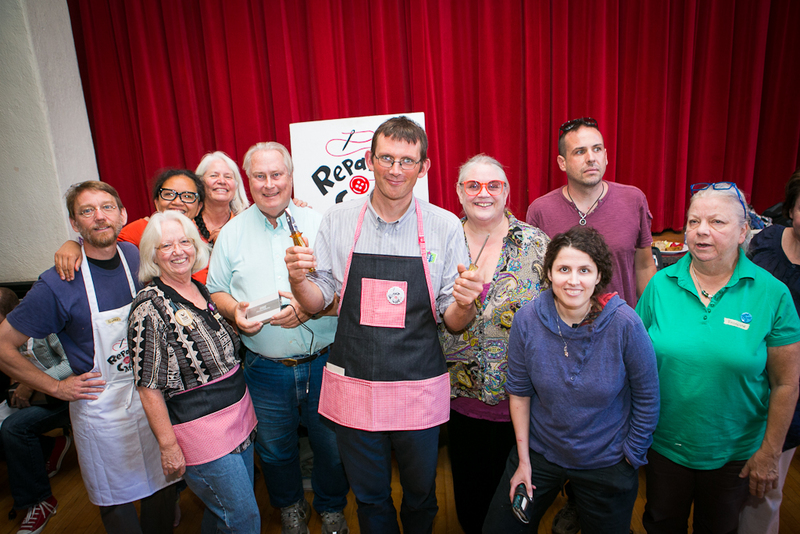 Transition Movement founder, Rob Hopkins, attends a Transition Pasadena repair cafe in 2013. Photo courtesy of Ginko Lee. 2. Transitioners of all ages participate in Transition Town Charlotte’s first repair cafe in 2017. Photo courtesy of Ruah Swennerfelt. 3. 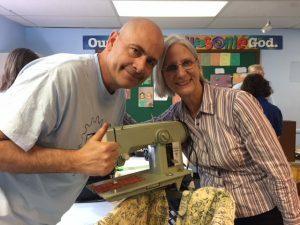 Mending not just fabric, but the fabric of community, during a Transition Howard County repair cafe. Photo courtesy of Margo Duesterhaus.